The earth is roughly a sphere so an unbiased method to bin surface temperature data is to treat the surface itself in 3D. Ideally each bin should cover exactly the same surface area, so that the global average is simply the average over all populated bins. 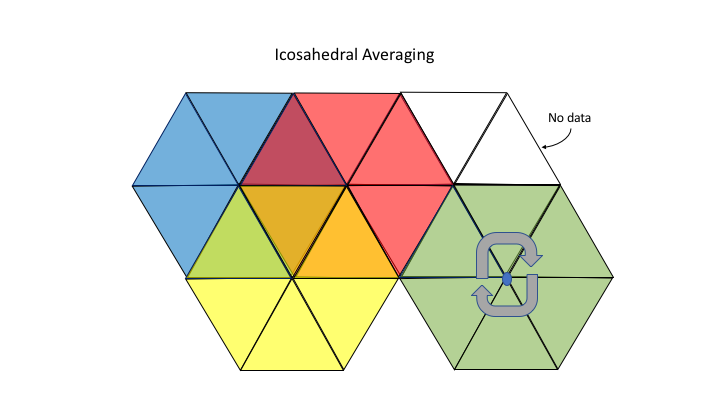 I have been using Icosahedral grids to try to solve this. An Icosahedron is a regular 20-sided object, whose faces are all equilateral triangles. By subdividing each triangle into 4 new ones and then extrapolating the edges to a unit sphere, we generate a detailed triangular spherical grid. Each subdivision or level increases the grid size by a factor 4. The diagram below shows the resultant grid up to level 3. I am currently using a level 4 grid which contains 2562 vertices, to analyse temperature data. What is interesting is that the corners of each triangle connect together the 6 neighbouring triangles to form equal area hexagons. In this way you can also view the grid as a hexagonal tessellation of a sphere. 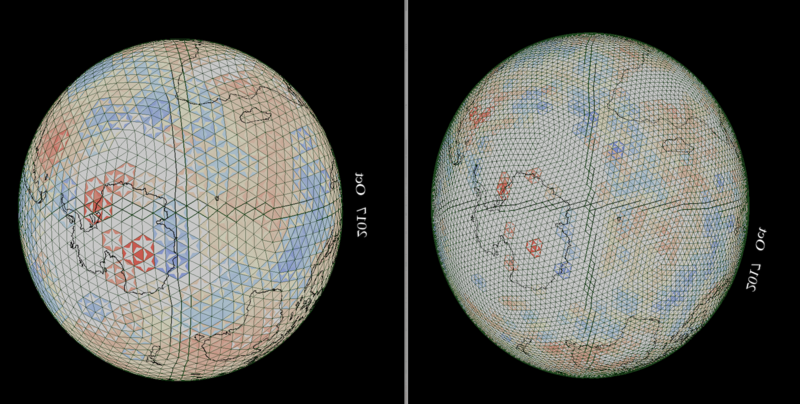 Scattered over the surface of the sphere are temperature measurements, each of which lie within both a single triangle and three neighbouring hexagons. The averaging method I am currently using takes each node on the grid and averages together all station temperature anomalies that are contained within the hexagon centred on that particular node. This results in an average temperature for each hexagon centred on each grid node. But of course these hexagons overlap with each other so that stations lying within one triangle contribute to the 3 neighbouring hexagons of which they form part. As a result there is a near neighbour averaging taking place at the same time. The example in Figure 2 shows a colour blending of 3 overlapping hexagons with primary blue, yellow and red shading. The overlapping triangles are colour mixed. This effect can also be seen in the rendering of the October 2017 results. Note however that IDL reflects the hexagonal structure differently in the shading. It doesn’t blend each overlapping triangle but rather divides the shading contributions. White triangular areas signify no data coverage contribution. Figure 3. 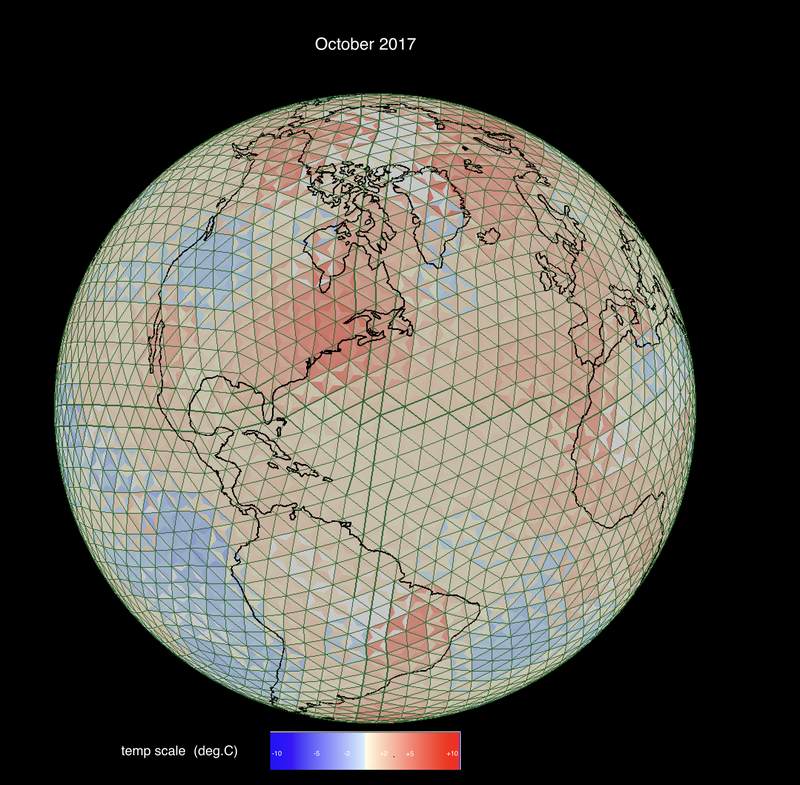 October 2017 temperature distribution on a level 4 icosahedral grid with 2562 node points. White signifies missing data. Can we do better than this simply by increasing the grid density? Each additional level increases the number of nodes by a factor 4. So a level 5 grid now contains 10224 node points adding also a factor 4 increase in computation time. The results from level 4 and 5 grids are compared in Figure 4. The smaller grid size works fine in the US where station density is very high, but elsewhere many empty grid cells start to appear. In addition there is a limiting factor on Ocean temperature data also causing empty grid cells. This is because HADSST3 has already been pre-binned onto 5×5° Lat, Lon bins. Mainly for this reason I have decided to limit the grid size to level 4. 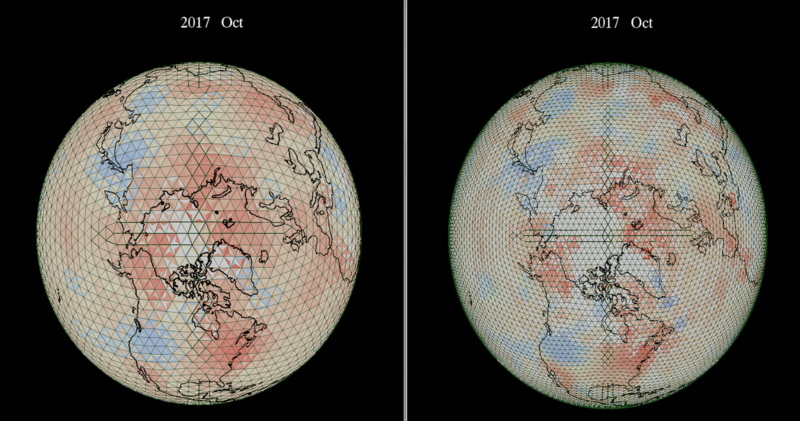 Figure 5 compares three different integration methods to calculate monthly temperature averages: 1) Spherical Triangulation, 2) Icosahedral binning, 3) Regular 5° Lat, Lon binning. In general the results match up very well. The main difference is how the polar regions are handled. Spherical Triangulation covers the poles by connecting large area triangles, while Icosahedral grids avoids any latitude binning bias. 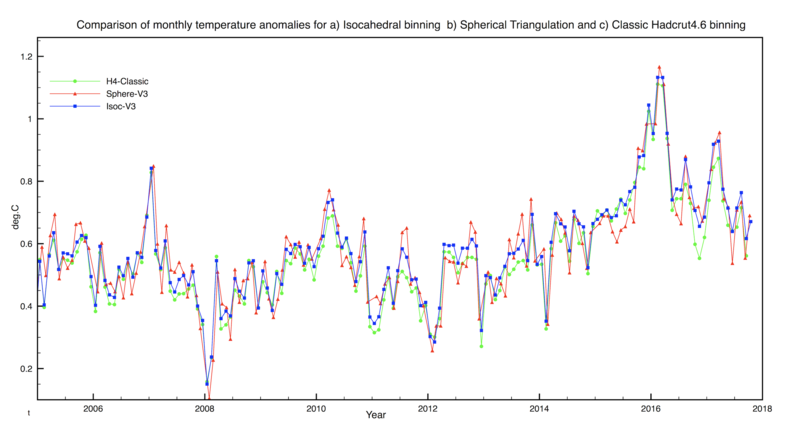 However, it is encouraging that three very different methods of averaging global temperature data give very similar results. This entry was posted in AGW, Climate Change, climate science and tagged GHCN, global warming, Hadcrut4. Bookmark the permalink. Clive, it appears that your method provides significant variation from H4 in precision but not in accuracy. If your method is more precise it could provide benefit for study of the hydrosphere, for example those who are studying ocean heat content response to surface temp. I think it just eliminates a bias that is inherent in all map projections. Whenever you try to map the world onto 2D, then you will always exaggerate some surface areas to the detriment of others. For example Africa always appears smaller than it really is.